Technique including major and minor scales, arpeggios, intervals, & technical exercises. Appropriate musical etudes. This will include everything from standard concert etudes to contemporary pop and traditional jazz repertoire. Elementary to advanced music theory. Elementary to advanced jazz improvisation techniques. Music appreciation. This includes lessons with music listening. How to practice. Including how to warm-up and get the most out of your practice time. Fundamentals of performing & auditioning for various audiences types. How to play in solo/ensemble situations (classical & jazz). 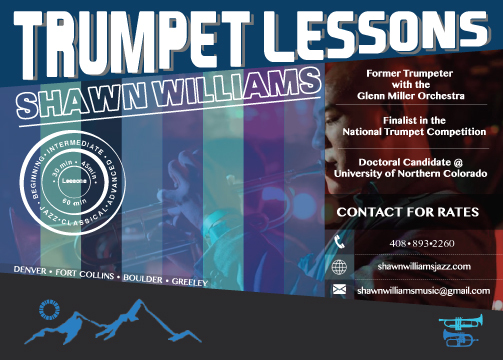 Shawn has been teaching trumpet and trombone lessons in Northern California for the past 4 years. In that time he has built a teaching studio of over 60 students ranging from 5 years old to adult, beginning to advanced. In addition to teaching privately, Shawn has vast experience working with groups of students in small and large ensemble settings. After spending the past 4 years (2013-2017) teaching in Northern California (Bay Area), Shawn will be relocating to Greeley, Colorado in August 2017 where he will begin his Doctorate of Art in Jazz Studies degree at the University of Northern Colorado. There he will offer private trumpet lessons in Greeley and surrounding cities, including: Denver, Boulder and Fort Collins. Contact Shawn for details pertaining to locations which lessons will take place. “Shawn became my daughter’s trumpet teacher a year and a half ago. She had been playing for almost a year at that time. During this time her playing has progressed dramatically. Last year, she auditioned for and was accepted into the California Philharmonic Youth Orchestra where the music ranges from Concertos and Symphonies to Handel’s Messiah to Selections from Harry Potter. In June 2015 she has been asked to accompany the senior CPYO to Spain where they will play concerts in four different cities.